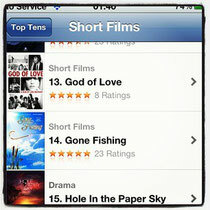 I thought I would share the recent sales report I got from iTunes via Network Ireland for my short Gone Fishing. The report landed on my desk around the same time as VFX expert Russ Wharton emailed me from his iPhone commenting that Gone Fishing is still charting VERY highly on iTunes shorts – when he took this frame grab we were at 14. I have occasionally checked in and we are usually toward the top of the charts, which is great news. So how do the figures correspond? Well this figures are for woldwide sales for one year, ending 30th June 2011 (reported to me late November). Total sales = £1,480 from which iTunes take a 30% cut. Then Shorts International take a 20% programming fee. From that balance Shorts International take a 50% commission. From that balance, Network Ireland (my sales agents who are really great I have to say) take a 30% fee. The remaining balance then comes to me. So from that £1,480, I get £290.26. I did a lovely chart to make the point even clearer. I have no problem with Apple, I think 30% is fair. I have no problem with Network Ireland, I think 30% is fair. But Shorts International taking a 20% programming fee (what is that?) and then a 50% cut is rather unfair. 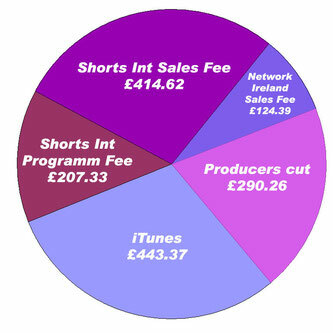 Apple will not deal with Network Ireland, they only distribute shorts through Shorts International. So it seems I do have a problem with Apple after all. Why won’t Apple even consider opening up their platform for creative people to sell their work? They are soooo happy to sell us the tools. They own the best distribution tool right now. But they won’t even entertain the conversation. Heya i'm for the primary time here. I came across this board and I to find It really useful & it helped me out a lot. I am hoping to give something again and aid others like you aided me.